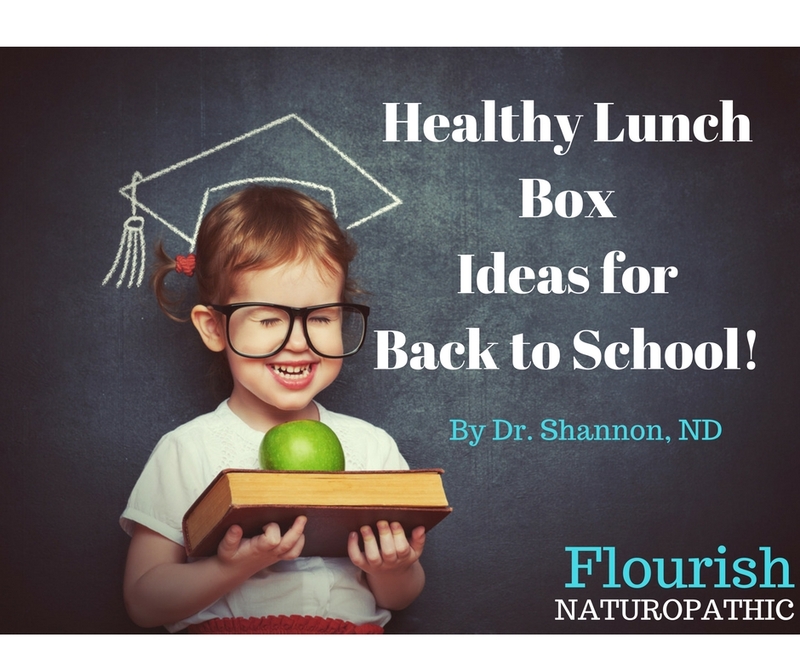 With school underway, many parents are pulling out their hair trying to come up with lunch box ideas that will please their child yet still pack a nutritional punch. With the right balance of nutrients in their diet, kids will feel energized, and have a strong foundation for learning and well being. Unfortunately foods marketed towards kids such as cereal, yogurt, and snack foods are often loaded with sugar, food dyes, and additives. These ingredients lead to fluctuations in energy and behavior, and can interfere with a child’s ability to focus. Avoid the processed foods and stick with whole foods that you prepare in your own kitchen. Be sure to include healthy protein and fats to feed the brain, complex carbohydrates for lasting energy throughout the day, and a variety of fruits and vegetables. Sandwich stuffers: try hummus, avocado, sprouts, almond butter/banana, cream cheese, veggies, egg salad, tuna or chicken salad. Pasta salad: try soba, quinoa, or whole wheat pasta with veggies, chickpea’s and dressing. For dressings opt for olive oil/lemon, pesto or sesame oil/soy. Soups are warming and nourishing during the winter months. Boost protein by adding chicken, lentils or split peas. Salad ideas: Greek salad, chickpea/orange/bell pepper salad, black bean/avocado/tomato salad, beet/apple salad, spinach/strawberry salad, quinoa/veggie salad or taco salad. Sushi or rice wraps with cucumber, avocado, lettuce and mango. Quesadilla with refried beans, cheese and diced veggies. Falafel balls made of chickpeas are fun to eat alone or stuffed in a pita pocket. Get cracking with eggs: quiche, frittata, hard boiled eggs, french toast or crepes. Fish cakes made with your choice of fish, potato, corn, zucchini, carrots and celery. Home-made chicken fingers with dipping sauce. Dips such as nut/seed butter, guacamole, hummus or other beans dips add nutritional value and make veggies more of a draw. Peanut-free classroom? Check with your school to see if seed butters made from sesame, sunflower, or pumpkin seeds are an appropriate replacement. They are a good source of healthy fat, protein, calcium and zinc. Boost protein by adding a hard-boiled egg, edamame beans, trail mix or sprouted beans which are fun to eat. Provide veggie variety by including cucumber, carrots, snap peas, celery sticks, olives, avocado, bell pepper sticks, zucchini slices, jicama, kale chips, broccoli, or cherry tomatoes. Add creativity by cutting foods into fun shapes and by providing a variety of colors and textures. And an occasional note lets them know you care and packs a little extra love. Dr. Shannon Sarrasin is a Naturopathic Doctor and proud Mama to an eleven year old daughter and six year old son. Dr. Shannon has a passion for working with kids of all ages. Learn more at Flourish Naturopathic.